It’s official. The red hot auto industry is finally cooling off after two consecutive years of record industry sales and seven consecutive years of annual sales increases. According to the Automotive News Data Center, U.S. sales of compact sports cars are up 3.4 percent in 2017, while overall car demand is off 12 percent, including an 11 percent slump in April. 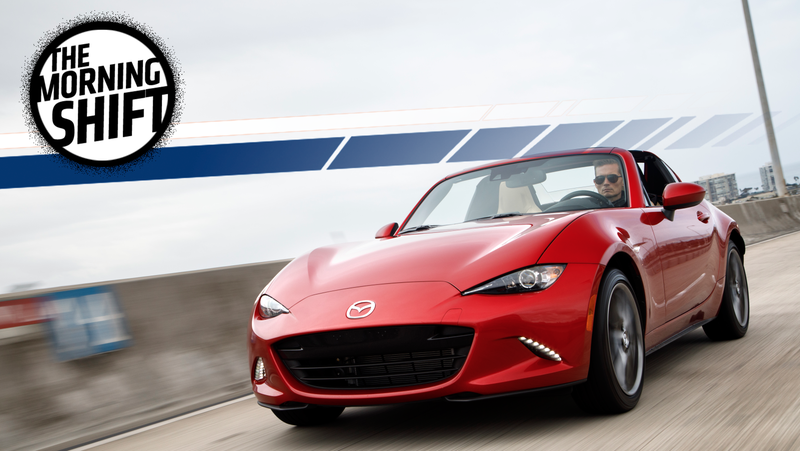 The report goes on, saying the Mazda Miata is killing it right now, with sales up 35 percent this year. Even the Miata’s sister, the Fiat 124, is “selling in steady volume,” and the BMW Z4 and Toyota 86 have seen their volumes jump a bit for 2017, too. Granted, these are all relatively low volume vehicles, and the Miata is only seeing its second full year of sales in the U.S., but it’s encouraging when you consider that mid-size sports cars—like the Mustang, Challenger and Camaro—are down 16 percent this year as they head into prime sales season. Heck, according to Automotive News, even Corvette sales are down 10 percent. So even if vehicle sales are down, at least sports car sales aren’t; that’s at least something, right? Hang in there little Miata; if this “plateauing” auto market takes a few new Camrys (Camries?) and Accords with it, so be it. But America cannot withstand a Miata shortage—we’re just not strong enough. So the honeymoon is over, but that doesn’t mean the sky is falling, even if it’s hard to forget that the last time the auto industry fell into a “trough,” it nearly wiped out half the American auto industry. The Detroit Free Press says new car and truck sales are down 4.7 percent this month (the fourth straight monthly decline), and the sales rate of 16.92 million fell nearly 200,000 short of the 17.1 million forecast. But as dark as that all sounds, multiple automotive experts told the news site they don’t think this is going to be anywhere near as bad as we all remember from the late 2000s. We have to let the year play out…I am not discouraged by the numbers. I view it as within some kind of normal range in a plateauing industry. When you look at the broader economy, including a strong job market, rising wages, low inflation and low interest rates, and couple them to low fuel prices and strong consumer confidence, you have everything you need for auto sales to … remain at or near historic highs. Karl Brauer, executive publisher for Autotrader and Kelley Blue Book, also chimed in, saying the transition into “negative territory” should be “much smoother” than the last time, which was part of an enormous economic downturn. So for all of you about to sell your stocks in the auto industry, just try to hold back those flashbacks from 2008—this time won’t be like that, hopefully. Structural changes since the scandal broke in Sept. 2015 include streamlining vehicle development, cutting material costs by reducing complexity in parts, dropping unprofitable models and shifting more power to brands and regions to respond more quickly to market needs. Group operating profit jumped 40 percent to 4.37 billion euros in the three months to the end of March, one of the carmaker’s highest-ever quarterly results, even as vehicle sales at the 12-brand group declined. Reuters goes on, saying first quarter operating profits of the company’s largest division went up to 869 million euros compared to 73 million the previous year, despite sales dropping 1.3 percent. This is all great news, and CEO Matthias Mueller attributes it to improvements in efficiency, saying: “Our efforts to improve efficiency and productivity across all areas of the company are also paying off,” a statement backed by his CFO, who says the sales results are the “first tangible results” of cost savings that went into place months ago. It looks like, out of necessity, VW has streamlined its business—maybe something good has come of the whole Dieselgate crisis? 4th Gear: Why Can’t Dealership Ravaged By Tornado Contact FCA? We’re all supposed to be partners — you make them, we sell them, all that stuff. It’s just very strange not to have heard from someone…I’m very disappointed that our manufacturer hasn’t even contacted us. I am very disappointed they haven’t done anything at all. After the news site published a story about how the dealer wasn’t able to get into contact with the automaker, finally—three days after the devastation—Fiat Chrysler contact him. Three days may not seem like a long time, but when your dealership looks like a pile of rubble, I can see how that might seem like an eternity.